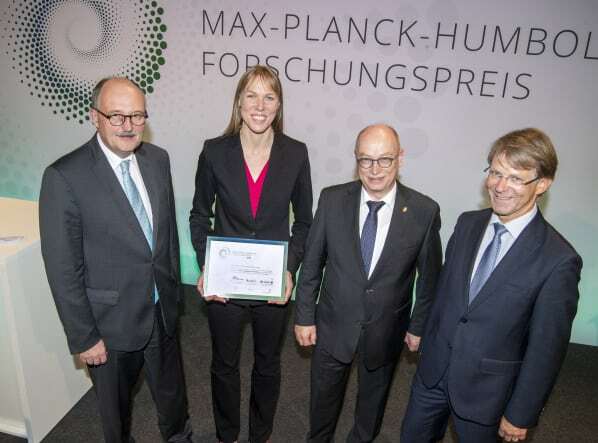 Catherine Heymans | Catherine Heymans, winner of the Max Planck-Humbold Research Prize, with Michael Meister (BMBF), Max Planck President Martin Stratmann and President of the Alexander von Humboldt Foundation Hans-Christian Pape (from left to right). Catherine Heymans from the University of Edinburgh in Scotland is the first winner of the new Max Planck-Humboldt Research Award. The award, which is worth EUR 1.5 million, is financed by funds from the Federal Ministry of Education and Research (BMBF) and awarded jointly by the Max-Planck-Gesellschaft and the Alexander von Humboldt Foundation. In addition to the astrophysicist, whose research focuses on Dark Energy, honours also went to the mathematician Sam Payne and the robotics expert Robert Wood, who received the Max Planck-Humboldt Research Medal and prize money of EUR 60,000 each. The awards were formally presented in Berlin on 7 November by the President of the Max-Planck-Gesellschaft, Martin Stratmann, the President of the Alexander von Humboldt Foundation, Hans-Christian Pape, and the BMBF State Secretary, Michael Meister. "Basic research is an investment into our future, carrying forward the science of tomorrow. It enriches our society in many ways: It increases our knowledge and is the seed for ideas and innovations of the future. If top scientists like Catherine Heymans help us understand the universe, they are also creating a basis for future technologies. Germany is one of the innovation leaders today, precisely because it is strong in basic research. We must maintain this strength. That's why we're delighted when we can attract outstanding scientists like Catherine Heymans to Germany as a hub of research," explained Federal Research Minister Anja Karliczek. The astrophysicist said: “In order to understand this dark secret, we may well need a new kind of physics which will forever change our view of the cosmos.” By observing far distant celestial objects, the scientist wants to find out whether Einstein’s theory of gravitation has to be expanded in order to explain certain phenomena. Heymans is the author of the book "The Dark Universe" and co-author of more than 140 scientific publications.